I have to admit. I am surprised that the total lean mass didn't but the sleeve size of the subjects did benefit from increasing the number of sets from 1 to 3 and from 3 to 5 sets. For legs this would have been something I would have expected. For arms, which are trained with almost every other exercise? No, not really. With their latest study, scientists from the University of Rio Grande do Sul, the University of Wisconsin-Eau Claire and the Federal Universities of Rio de Janeiro and Maranhão tried to fill the gap that exists with respect to studies comparing the effects of multiple sets, greater than 3-sets, on strength and muscle hypertrophy over long training periods. Accordingly, the aim of the study was to compare the effects of 1, 3 and 5-sets on the changes in the muscle strength and endurance, muscle hypertrophy, vertical jump performance and body composition over the course of a six months standardized training regimen. The hypotheses of the study was that multiple sets would result in greater changes in training outcomes than single sets and that there would be a dose response for training outcomes. 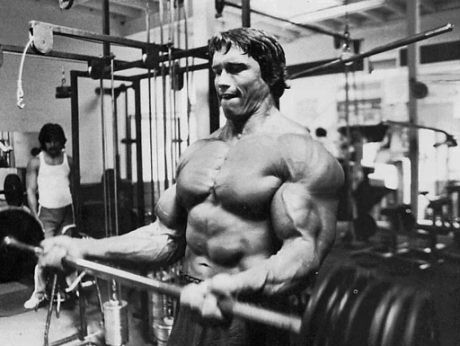 Are you looking for other muscle builders than volume increases? In view of the fact that the subjects were 48 men from the Brazilian Navy School of Lieutenants (mean ± SD age = 24.4 ± 0.9 yrs; body mass = 79.3 ± 9.1 kg; height = 174.5 ± 5.5 cm) who were familiar with all sorts of body weight "strength training" drills, but had not trained on any of the Life Fitness machines that were used in the study, it's not unlikely, though, that even one set of bench presses, leg presses, lat pulldowns, leg extensions, leg curls, biceps curls, ab crunches and triceps extensions, which were performed thrice a week, would suffice to produce significant results (also compared to the regular military training the men in the control group performed). 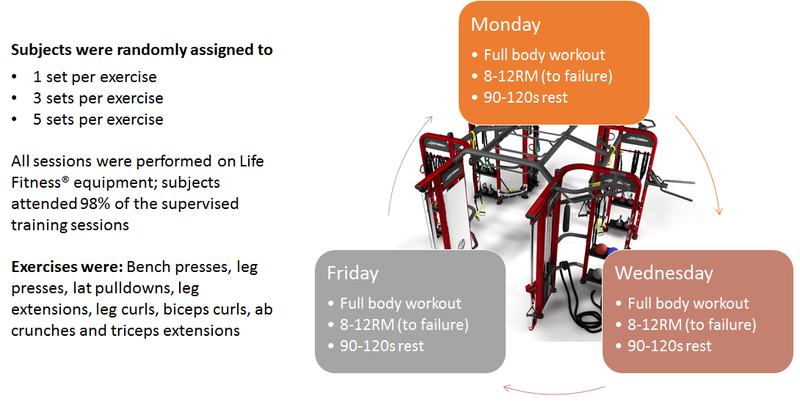 Figure 1: Overview of the 6-week resistance training protocol used in the study at hand. All exercises were performed with a weight of 8-12RM (meaning the subjects failed after 8-12 reps) and a rest interval of 90 to 120 seconds between sets and exercises. The training resistance was increased by 5-10% for the next session when subjects were able to perform more than 12 repetitions in all sets of an exercise. 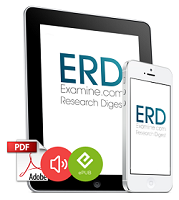 What's different to previous studies? As previously mentioned this is the first study to compare three set-ranges (1, 3, 5 sets) over a long study period. Accordingly, it's not necessarily surprising that the results of the study at hand stand in conflict to studies by Bottaro et al. (2011) ot Hanssen et al. (2013), which found no significant difference between one and three-set training protocols. On the other hand, the results are partly in line with those of a 2007 study by Rønnestad, et al. who found benefits of three sets, albeit only for the legs. Overall, the total training volume (number of exercise) and study length of the previous studies was yet lower than that of the study at hand. This suggests that it may be the 2x higher volume difference between 4x1 vs 4x3 as in Ronnestad et al. (2007) and 8x1 vs. 8x3 vs. 8x5 in the study at hand that may have made all the difference. 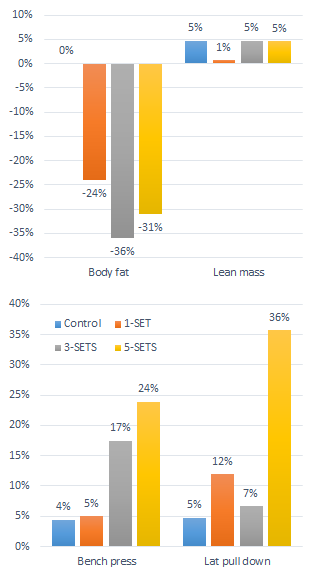 Figure 2: Changes in body composition (top) and bench press & lat pulldown 5RM (Radelli. 2014). All training groups recorded significant strength gains for bench press (BP), front lat pull down (LPD), shoulder press (SP) and leg press (LP) (p≤0.05) exercises, but the 5RM (maximal weight the subjects could lift 5 times) increased significantly more for both bench presses and lat pulldowns in the 5- SETS compared to the other training groups (p ≤ 0.05). In the 20RM (maximal weight with 20 reps) bench press tests both the 3- and 5-SETS groups saw significantly greater strength increases than the 1- SET group, with the 5-SETS protocol also producing significantly greater increases in strength, than the 3-SETS group (p≤0.05). In the 20RM leg press tests only the 5-SETS protocol yielded significantly greater strength gains than the 1-SET protocol. For the 3- and 5-SETS groups the scientists also observed significant increases in elbow flexor muscle (biceps) thickness (MT) with the 5-SETS increase being significantly greater than the other two training groups (p≤0.05). In spite of these differences, all training groups decreased percent body fat, increased fat free mass and vertical jump ability (p≤0.05), with no differences between groups. In spite of that, "the results demonstrate a dose response for the number of sets per exercise and a superiority of multiple sets compared to a single set per exercise for strength gains, muscle endurance and upper arm muscle hypertrophy" (Radelli. 2014). (Fr) Pull day: Pull up, DB row, biceps curl, stiff legged deadlift, abs. Same procedure as in the study at hand, 90-120s rests between sets, 8-12RM (to failure). Bottom line: If we go solely by the results of the study at hand, it would appear prudent to add a set or two to your training regimen. In view of the fact that most of you will probably be training according to a body-part split, I doubt that you will be doing significantly less than 5 sets for any of your muscle groups, anyway. In view of the absence of beneficial effects on the body composition and considering the fact that the arms, of all muscle groups, were the only ones that grew significantly, it's still questionable how beneficial a volume increase in 2015 would be. As a SuppVersity reader you will also be aware that previous studies showed that a higher volume training is beneficial for the legs ("8 sets of squats outperform 1 and 4 sets" | read more). This result was yet observed in highly trained individuals and stands in contrast to the recent revelation that you can "Cut the Volume, Still Make the Gains!" (read more). I would thus suggest you keep that in mind, when you plan your 2015 workout routine. 5 sets per body part!? Fine! 10 sets for legs? Fine! But four exercises à 5 reps for chest? Madness! Comment on Facebook! Bottaro, M., et al. "Resistance training for strength and muscle thickness: effect of number of sets and muscle group trained." Science & Sports 26.5 (2011): 259-264. Hanssen, K. E., et al. "The effect of strength training volume on satellite cells, myogenic regulatory factors, and growth factors." Scandinavian journal of medicine & science in sports 23.6 (2013): 728-739. Rønnestad, Bent R., et al. "Dissimilar effects of one-and three-set strength training on strength and muscle mass gains in upper and lower body in untrained subjects." The Journal of Strength & Conditioning Research 21.1 (2007): 157-163.